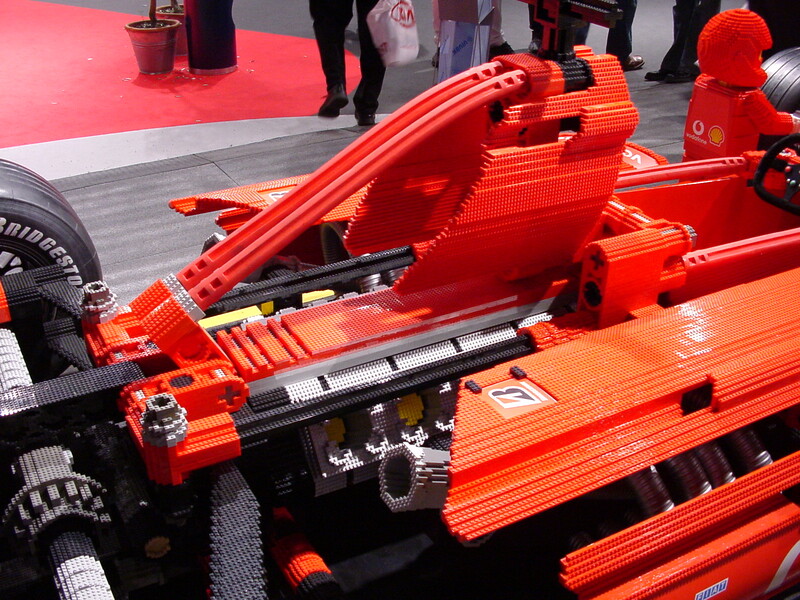 Today we will talk on the subject of scaled up TECHNIC models, ever produced by LEGO. 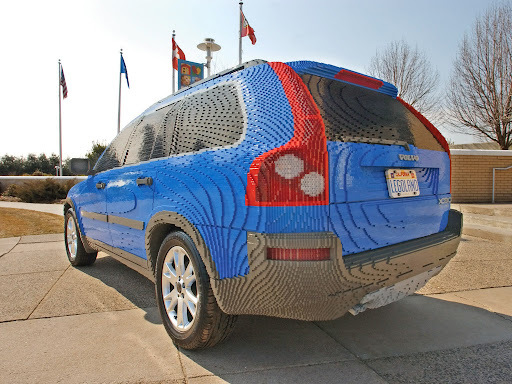 Usually they are cars reproduced with regular LEGO bricks and made at human scale, i.e. about 10 times larger that the original TECHNIC sets, they represent. Maybe the most famous one came out in 1994, after the release of '8880, Supercar' in the same year, and which TLG's professional model makers, built ten times larger. About 650.00 bricks were used at this scale, to reproduce the original which has "only" 1.343 parts. 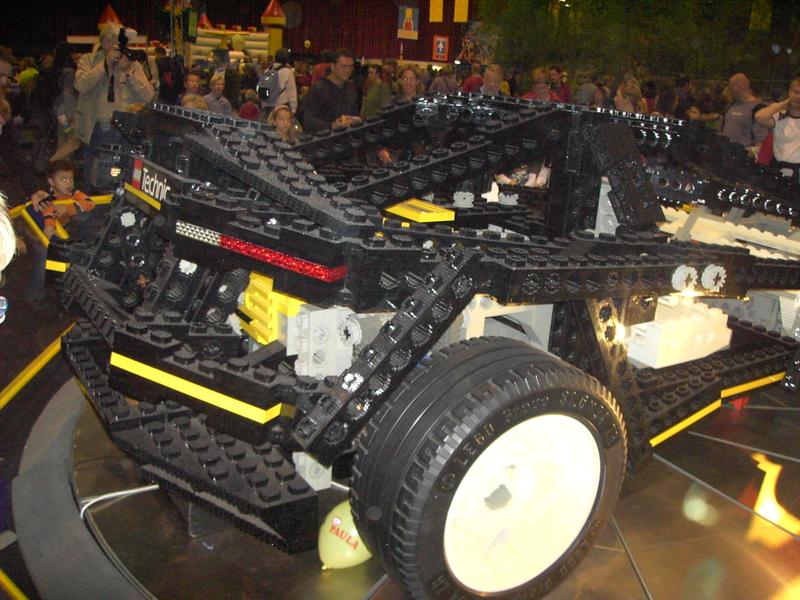 This car was unveiled at the "Mondial de l'Automobile1994" exhibition in Paris and since then, it has been in several places and exhibitions, like the LEGOLAND parks int the 90s and LEGOWORLD events. From left to the right: LEGO Designers working on the model; News about the exhibition in Paris at a Danish newspaper; The model in exhibition at LEGOWORLD Oslo 2008. It should be quite heavy and difficult to keep all the bricks tight in place. Realize on the metallic supports used below the front and rear axis to support the weight. This model made the its last public apparition at LEGOWORLD 2008 in Zwolle, last month from where I took the video below, trying to capture the most important construction details for you to see. In the right, a close-up image taken by my fellow PLUG member Ricardo Oliveira. Find about a dozen more after this, at his BS folder. 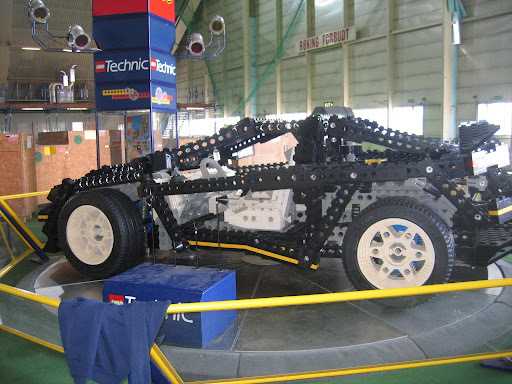 Another large scale model for a LEGO TECHNIC car, was built based on the '8386, F1 Ferrari Racer' from 2004. 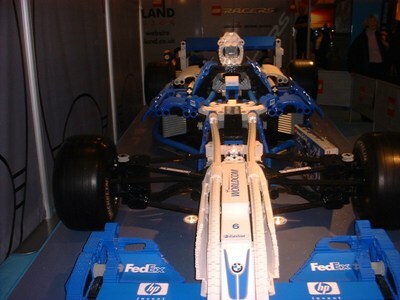 This model was exhibited at Copenhagen Motorshow in Denmark, from which we could see some photos at the BS folder from Byggepladen (Danish LEGO Fan Club). 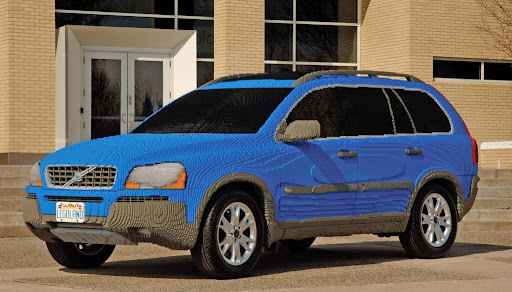 Some other similar models are known to have used a metallic structure, which was then covered with LEGO bricks, as it is the case from the Volvo XC90 in the images below (however not a TECHNIC model) resulting from a partnership between Volvo Cars North America and LEGOLAND® California, for exhibition in the park. 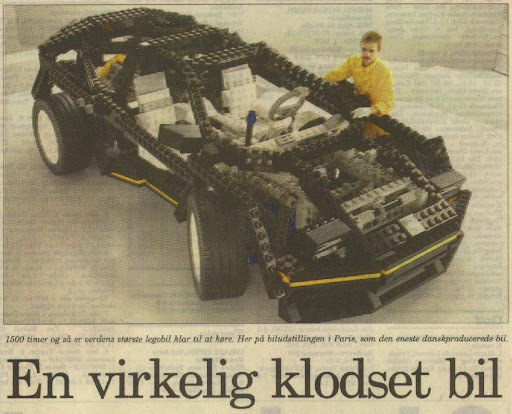 More recently LEGO Designers made another large size replica from a TECHNIC model, the '8285, Tow Truck' from 2006. It was made to be used as in-store promotion material in Germany. It was not 100% at human scale this time, but around 4 meters long. So, still a pretty big model. The original model on the left, and its large scale version at Bricking Bavaria 2008 on the right. A good source to be updated about large scale models, is always of course the 'Scaled-up LEGO Bricks' blog. Thanks to a Parax (Mike Hatton) comment on this post, we came to a few other large scale models, I didn't see before or even know about. Unfortunately doesn't seem to be much information available, but here they go anyway. The '8458, Silver Champion' from 2000 on the left, and '8461, Williams F1' from 2002 on the right. 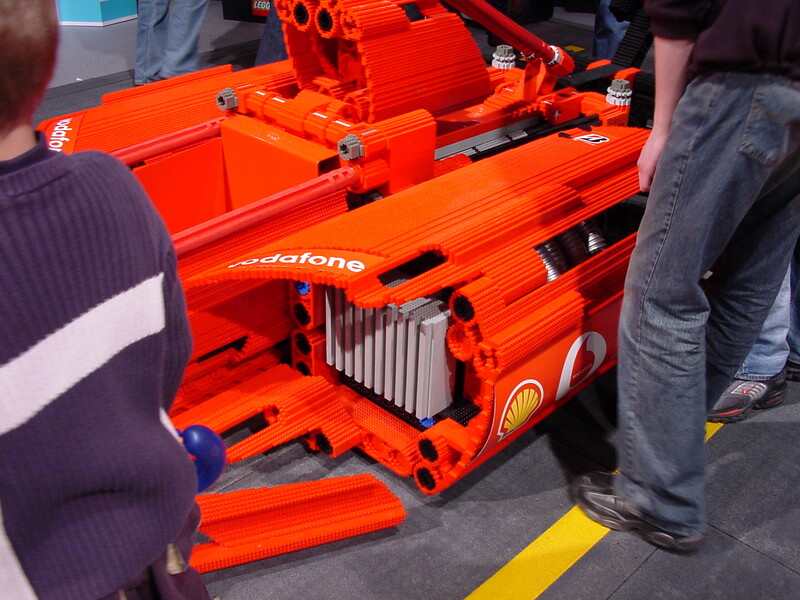 This last one being exhibited during 'International Motor Show 2002', at Birmingham (courtesy of Flash Bristow). 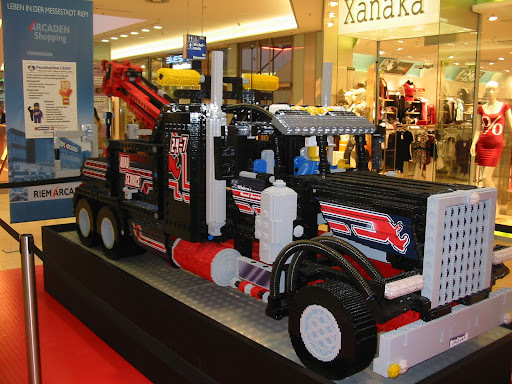 I was lucky enough to help building that super-sized Ferrari (or atleast same kind of creation) at a LEGO show which was held in largest mall of Finland, Ideapark (near Tampere). 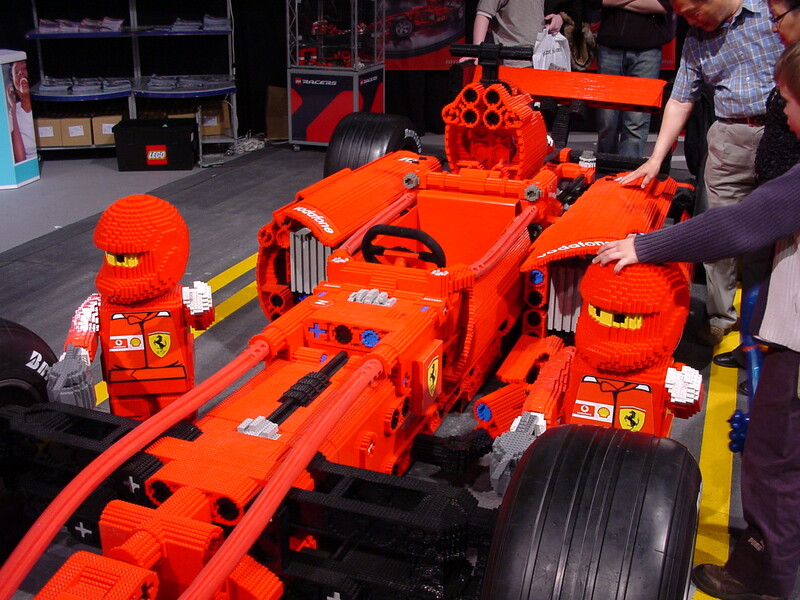 I was there setting up few MOCs from Finnish LUG when the LEGO employee asked if I could help getting the Ferrari completed. I added bunch of details, mainly on the front "wing". The "wing" was made out of plates which had been stacked and glued together very tightly. After that, the parts that made the wing had been cut via "hot-wire saw". It looked awful from a fan's perspective. The Ferrari had been in Finland several times before so I suspect there are atleast few same kind of cars which tour the world. Did you have printed instructions to follow, while doing that job? There is a silver champion around too. Never seen these before or even knew about their existence. Unfortunately it seems there is not much information about these models. Anyway I'll add a reference o them, in the original post. The Ferrari's discolouring just serves to show how reliable are the good "old" solid parts: no disfiguration (apart from some accumulated dust) on the jewel that is the 8880! Also, I've seen a basketball player at an exhibition organised by my LUG and a Hagrid "minifig" at a shopping mall, but never guessed "scaling up" LEGO sets was so common. Both of these cars were on display in the UK at the motor show at the Birmingham NEC, I saw the silver champion in 2000 (I think) and the Williams as you said was 2002.